Bigger is better in the world of wind power! Efforts to increase wind power mean that turbine blades are getting bigger and bigger. While other technologies are getting smaller and smaller with each passing day, wind turbines are going in the opposite direction, because in order for them to make enough power, they need to harness more wind. Economies of scale mean that while a large turbine requires more energy to build than a small one, its power output is proportionally far greater. Following this logic - Meet the world's biggest wind turbine which is more than two football fields in size, the researchers are taking turbines to a seemingly impossible scale by giving them blades that are 200 metres (656 feet) long. Size matters so much because, all other factors being equal, a larger wind turbine delivers a higher power output. A Department of Energy-funded research group spanning several American universities is proposing a wind energy scheme involving almost unimaginable scales. The technology, which is still several years off from even being tested, would be capable of generating 25 times the power of a contemporary conventional wind turbine, but it would also come at a cost. As Rob Nikolewski reports for the LA Times, the new turbine will reach 479 metres (1,574 feet) into the sky - a height that's 30 metres (100 feet) taller than the Empire State Building. To keep it stable, the structure would have a diameter of roughly 400 metres (1,312) feet. According to the team, the size of the turbine isn’t the only thing that separates their design from past models. One of the biggest differences is that this new turbine wouldn’t face the wind. Instead, it would face downwind to allow easier flow. Which makes total sense - why fight against the energy you’re harvesting? 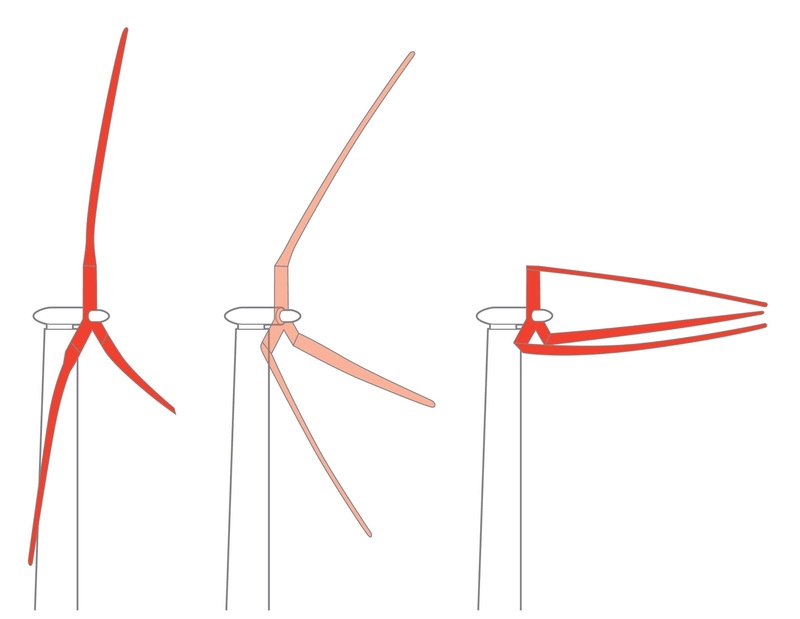 The 200-metre blades, which are almost too large to conceive of, would have segments that can spread out in light wind and tighten up in strong winds. Besides collecting more wind at all times, the segmented design, dubbed Segmented Ultralight Morphing Rotors, makes building and transporting the blades way easier than single-framed blades. Imagine trying to transport a blade that's roughly two football fields long - not an easy task. If everything goes the way they plan, the turbine could generate up to 50 megawatts of electricity - 25 times more energy than a traditional wind turbine. The team is currently working to produce a 1/10th scale version of their turbine, which they hope to have ready for testing by 2019. After that, they claim it will still take roughly 15 years or so to make a full-scale version. So far, the US Energy Department has given US$3.5 million to the project - a price tag that will be sure to rise as research continues. "The concepts have all looked very promising, but they're all pure simulations," Eric Loth, an engineering professor at the University of Virginia, told the Times. "Now we're actually going to build something. That's where the rubber meets the road." The first prototype will be only a tenth the scale of the final product and it should be ready for testing by 2019, as reported by Motherboard.